The Food Network star taught Colbert how to use Chianti three ways in the kitchen—including drinking it. Giada De Laurentiis stopped by The Late Show with Stephen Colbert last night and she brought a case of wine with her. The purpose of her visit was to teach Colbert and his audience to use Chianti three ways in the kitchen. The first way? Drink it. That’s when things go off the rails. To her credit, De Laurentiis does stay committed to cooking. Her second use for the Chianti is to cook spaghetti in it, turning the noodles a lovely burgundy color. She tells Colbert that you can use any type of Chianti you like to drink in the recipe. Then she adds the cooked spaghetti to a pan with turkey sausage and asks Colbert to grate some Parmigiano cheese over the top. Keep in mind that Colbert had just chugged an entire glass of wine, so when he took the cheese grater from De Laurentiis, his hands weren’t exactly steady. He starts grating the cheese, and it actually looks like he’s doing a good job, chatting away as he does it, but suddenly he realizes he’s cut himself. De Laurentiis’ solution? Drink more wine to make the pain disappear. Seems like good advice. The pair does eventually make it to the third dish complimented by wine, this time a vanilla gelato soaked in a Chianti broth. 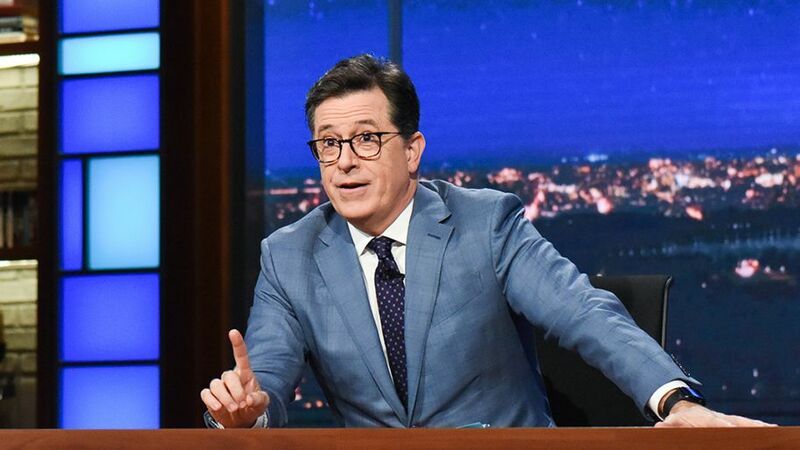 Colbert seems to genuinely love the dessert, scooping up bites as he cradles his injured finger, now wrapped in a white cloth.